‘I’ll be back while my disciples are still alive’. Christians hedge round this one by saying God answers prayers in his own time and in his own way. His answer might be ‘no, you can’t have that’. But that’s not what Jesus says. He says ‘Whatever you ask… anything… will be yours.’ What is this if not a false promise? Believers regularly walk on water, turn water into wine, and – slightly less frivolously – raise the dead. Except… no they don’t. It doesn’t happen. They should be doing even more startling things than this too – Jesus promises ‘greater works’ than his – but again, two thousand years on and they haven’t even mastered basic mountain throwing. What a let down. What hokum. Which is why, I guess, we have no need of hospitals, because Christians can heal everyone; why members of those fanatical snake-handling churches in America, who take Jesus at his word… erm… regularly die from snake bites. And not even these true believers are crazy enough to drink poison. There’s a limit to how much faith even gullible Christians have in Jesus’ empty words. Yeah, right. His followers recognise how useless this one is too; they do strive to make a living and provide for their families. None of them wait for God to provide because they’d be dead before he got round to it. Oh, come on. Now he’s just being silly. And that’s only a few of them… Jesus’ promises. All as worthless as the proverbial chocolate fire-guard. Christians, of course, know this well. They neither trust in his promises nor demonstrate them in their lives. As it is, how they live is indistinguishable from everyone else; completely devoid of miracles and lacking in any supernatural provision. They tell themselves (and us) that Jesus is special but then disregard most of what he said – and who can blame them from that? 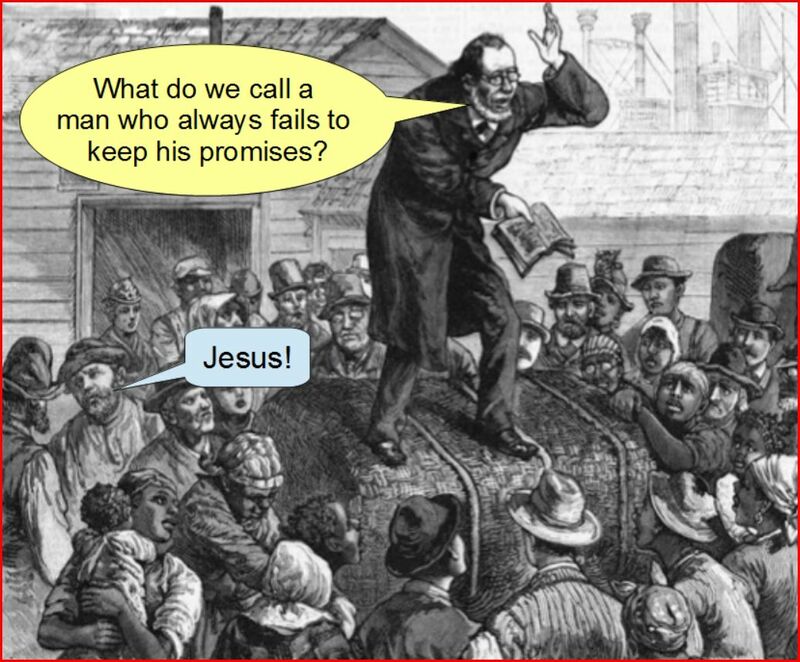 Anyone else who made the sort of ludicrous promises Jesus did would be dismissed as a fool and a charlatan. It’s way past time we recognised Jesus as just that. This entry was posted in Christian extremists, Christianity's failure to deliver, The impossibility of faith and tagged charlatan, Christians, empty promises, false promises, Jesus, John's Gospel, Luke, Mark, Matthew, miracles by Neil. Bookmark the permalink. I know someone who moved to Tulsa with the belief that God would supernaturally supply the money to go to a bible college and become someone great for God.They ended up destitute in a homeless shelter and mentally scarred for life. But of course this wasn’t God’s fault but theirs for not having enough faith to please God which adds double shame and embarrassment. The stories of people who really do take these promises at face value as they were taught are tragic. Sounds like you’re hanging on to vestiges of faith there, despite what you say in other comments. You’re right that your friend’s misfortune wasn’t God’s fault, but that’s not because they had insufficient faith, it’s because there’s no God! There’s really no other way to take Jesus’ promises but at face value (they’re meaningless interpreted metaphorically) and as such, no amount of faith makes them ‘work’. I hope you’ll keep reading and commenting. Thanks Neil,-what I said about it not being God’s fault I was saying sarcastically since that’s what is taught by the “faith preachers”-Don’t blame God! When you step out on these promises like they encourage you to do and you fail,it’s not god’s fault but your own since you have sin in your life and/or not enough faith.It’s like faith is cash that you can please god with and cause him to help you, based on Heb 11:6.And I heartily agree that this god or God was never there and doesn’t exist. Got you… and you’re right. I tried to point this out, too but was told that Jesus was using hyperbole to make a point. I have no tolerance for the very son of God using hyperbole. Either we can move mountains, cast out demons, and raise the dead or we can’t. If God came to Earth just to dazzle us with his literary devices, then maybe we should just pick and choose what we want to believe and then just explain away the rest (oh, right, that is how it works). Well said, Alice. If it is hyperbole, then it’s saying what, exactly?